Apart from this present compilation … there appear to be no collections of verse-letters written by men in the personas of women since Ovid’s Heroides. I found this quite surprising, because to my accomplished literary taste, such a verse-letter has a number of quite useful qualities, all of which I’ve drawn upon for the letters and diary-entries and reports that I’ve retrospectively placed in the hands of some exceptional Australian women. Timoshenko Aslanides’ first book of poems, The Greek Connection, won him the British Commonwealth Poetry Prize for 1978 for the best first book of poems in English, published the previous year in the British Commonwealth of Nations. In his numerous subsequent books of poetry he has sought to describe and affirm what it is to be an Australian and to celebrate the natural and built environment of the country, and the history and imaginative genius of the people. A proudly Australian-born and Australian-focussed full-time professional poet, Timoshenko Aslanides has noted that this is, very probably, his last book of poetry. We, and his readers Australian-wide, sincerely hope that it is not. It is, in any case, an original creation in Australian literary culture and a fascinating contribution to it. 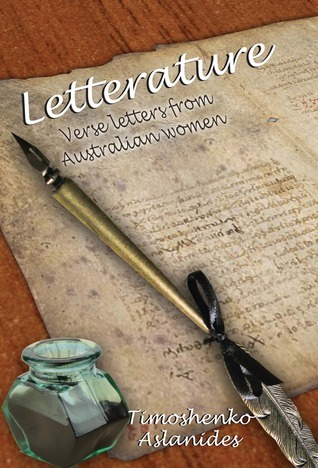 You can buy a copy from Fishpond: Letterature: Verse Letters from Australian Women or direct from Hybrid Publishers. Be in it to win it! Anyone with an Australian postal address is eligible. Please indicate your interest in the Comments box below and I’ll select a winner using a random generator round about the end of this month. All entries from readers with an Australian postcode for delivery will be eligible but it is a condition of entry that if you are the winner, you must contact me with a postal address by the deadline that will be specified in the blog post that announces the winner. (I’ll redraw if this deadline isn’t met). I will pass on the postal address to Hybrid Press and they will post the book to the winner. I shall put my hand up for a chance. Would love the chance to win this book, Lisa. Epistolary writing in all its forms fascinates me. Count me in to win a copy. Thanks for the chance. I’ll put my hand up Lisa – will help my teaching and hopefully inspire some of those in my class and introduce them to yet another genre of writing.